The unprecedented demand for well-trained cybersecurity workers continues to grow. Some experts predict that there will be a global shortage of two million cybersecurity professionals by next year. This is critical considering the increase in cyberattacks and the erosion of consumer trust in the ability to protect the internet. Enlisting the next generation of skilled cybersecurity workers and training existing employees will help build stronger defenses and restore confidence among digital citizens. 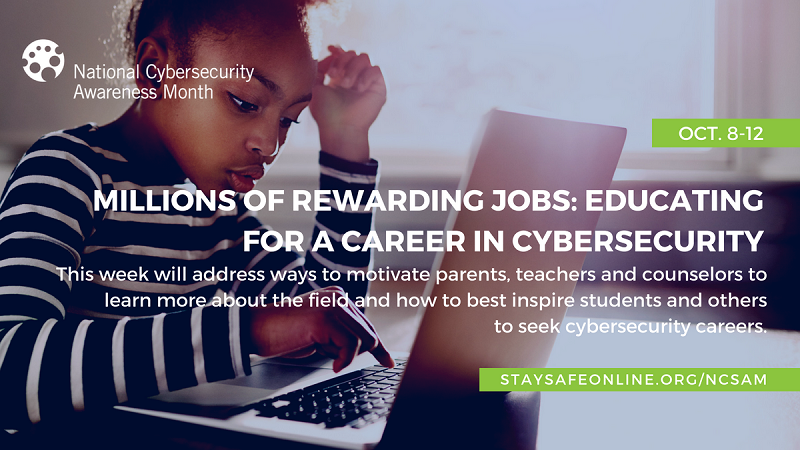 According to an article in the Harvard Business Review, important attributes of accomplished cybersecurity professionals include curiosity and a passion for learning, problem solving skills, strong ethics and a keen understanding of risks. In addition, job seekers with nontraditional backgrounds may bring new experience and perspectives to the position. And, a variety of industries ‒ ranging from education, financial institutions and banks to fashion, design and retail – are hiring. The bottom line is that the profession is dedicated to helping make our borderless online world safer and more secure for everyone.